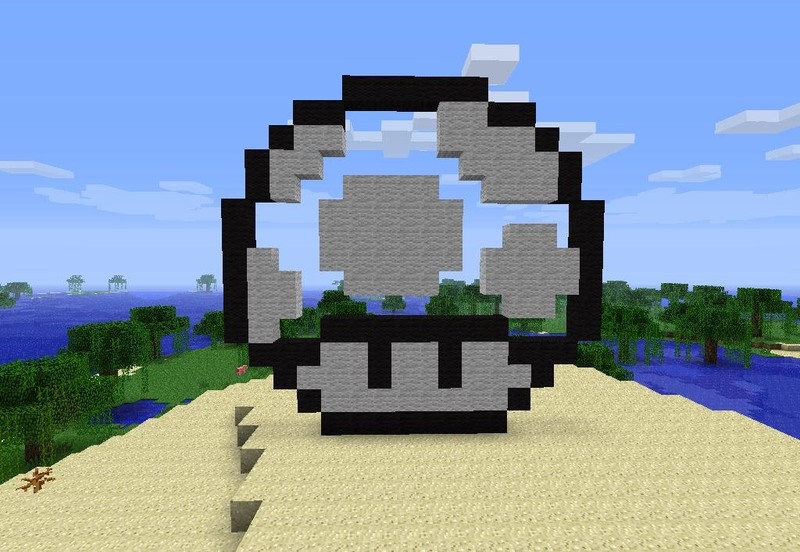 One of the easiest ways to get your creative juices flowing in Minecraft is pixel art. 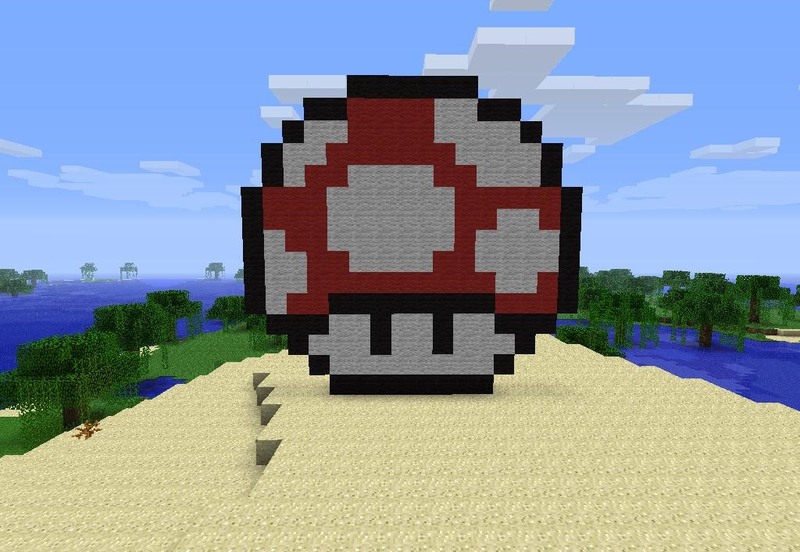 Pixel art uses various blocks in Minecraft to create pictures. These pictures are typically scenes from retro video games given the bit map style of art that those early games utilized, but they can truly be anything—from original artwork to copies of Michelangelo. Creating pixel art is fun and simple. Probably the best blocks to use are the wool blocks, given their multicolored nature. To begin, think of your blocks as colors in a painting and place them on a flat vertical surface (depending on the desired effect). The more blocks you use, the more detail you can create, this is why video game art works so well on the small scale. If you want to make 8, 16, or 32-bit pixel art, simply find your favorite picture in said genre and copy it block by block into your game. It helps to throw a grid on the image sometimes to further clarify how many "pixels" or blocks should go in each area of your image. 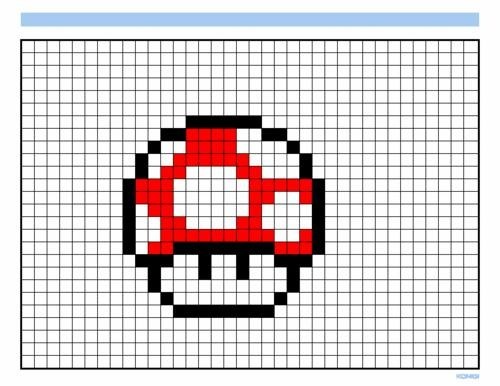 (1) Here is a mushroom from Super Mario Bros. that I want to copy in game. I place a grid over it in paint to simplify the process. (2) Here I simply counted each black block and it's position and filled it in. (3) This was followed by filling in the white sections... (4) Finally, I filled in the red. It's as simple as that. As rudimentary as pixel art may seem, you can make some pretty cool pictures with it, like this video game inspired art by user thecorrupted. The best thing about pixel art is that you don't need any artistic talent to make cool stuff, but that doesn't mean some very creative people haven't applied their talents to the art. There is some really detailed and original work made from pixel art. 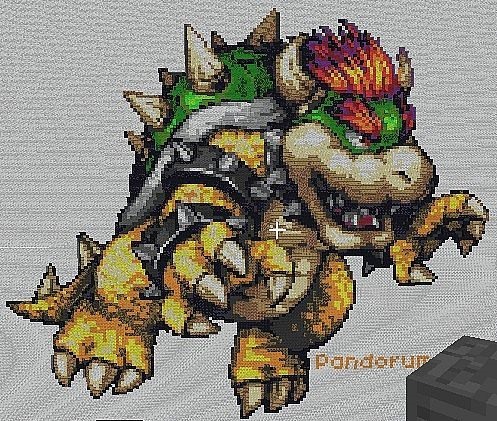 (1) This rendition of Bowser was done by hand by user Pandorum. 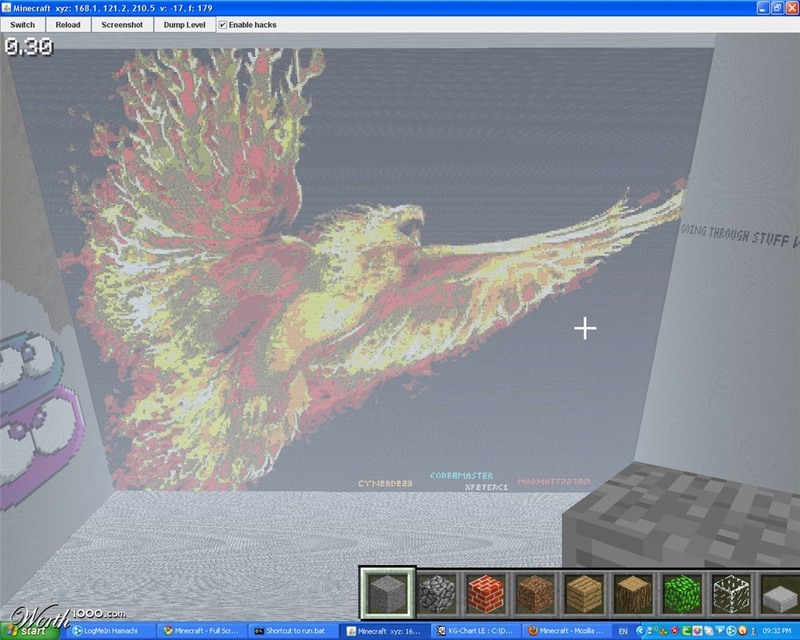 (2) This awesome phoenix was created by user Madmatt22790, (3) This pixel art picture by user Zaratustra looks very realistic! This pixel art mash up video by user AzureNotes contains over 300 examples of great pixel art! If you want to make some detailed pixel art, but don't want to spend the time and effort, thinkminecraft.com will convert any image to use as a template or upload as a schematic and place on a server. 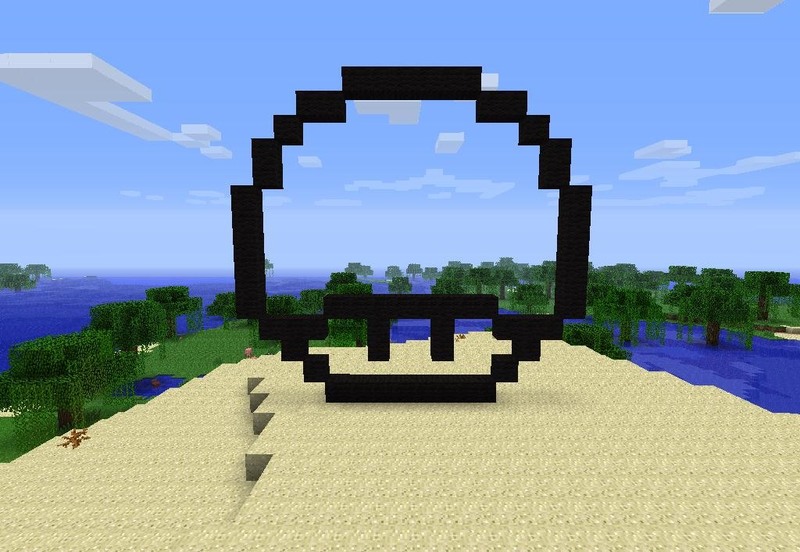 Feel free to come on the server and experiment with your pixel art. When you log on, type "/warp pixelart" in chat and paint away! Whoa. How long did it take AzureNotes to make that museum? Crazy. No idea. Had to be a long time! Ive always been a huge fan of pixel art, its so accessible. You don't need mad skillz as an artist to create great pieces, just follow a pattern. I just wish people would spend more time creating their own pieces instead of replicating old 8-bit characters, although it is always nice to see some pokemon. Yeah it would be nice to see original art made. Pssst, you should make some on the server. Just sayin'! FIRST FACEBOOK LIKE! Thats weird cause this just an awesome site! could you post some ´´easy to make´´ pixelart!? 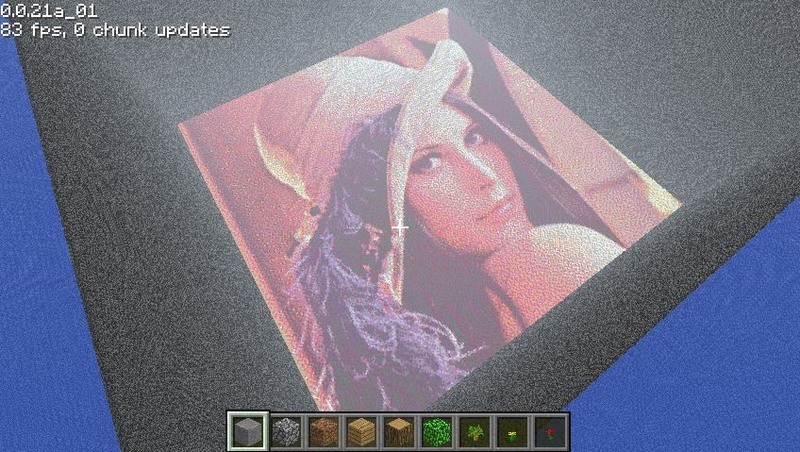 And could you make some pixelart on my server!? please? PS. all the signs is on swedish but that dosent matter. just right-click the ´´pixelart´´ warp sign and ask me (DarkFist900) for permission. Server online from 4 to 7. im always online. i'm not a mod, but i'm pretty sure you're not supposed to advertise servers in any way. You can advertise other servers, Sno, but only if someone asks, or if you're also sharing content with us. We don't want any super-blatant ad posts. Srry, i'm used to servers that have those kind of rules. That just shows how much better this one is than other ones i've been on :P. WOw!!! 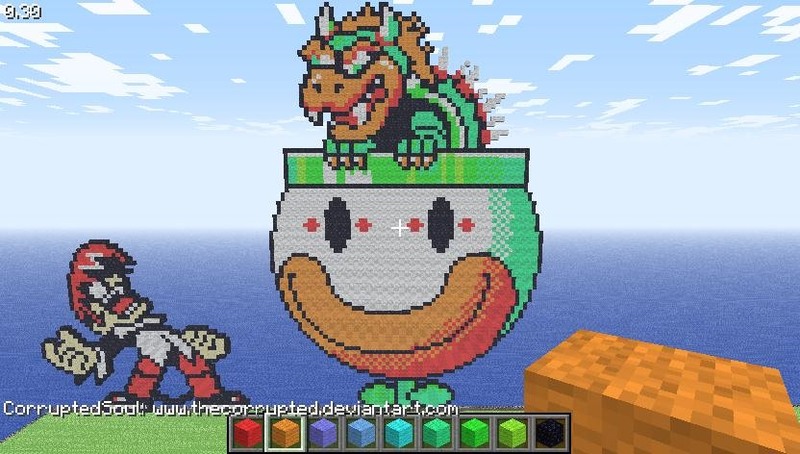 How Long Did It Take To Build Bowser?!?!? !